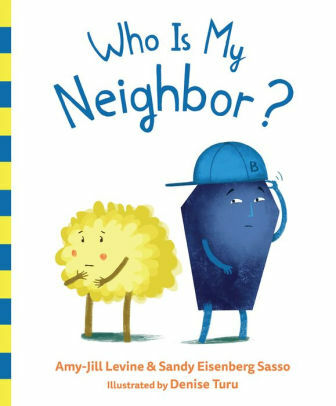 Storypath » Who Is My Neighbor? Name of Book: Who Is My Neighbor? Summary: In a retelling of the Parable of the Good Samaritan, two communities, the Blues and the Yellows, consider themselves enemies. For years they have warned their children not to go near anyone in the other town, because, “They are not our neighbors.” One day Midnight Blue falls while riding his bike. Both Navy Blue and Powder Blue pass him by without helping. Only Lemon Yellow overcomes her initial fear and gives Midnight a ride to her doctor and makes sure that he is cared for. When the two children later tell their respective clans about what has happened, the grown-ups open their imaginations to the possibility of friendship with the Other, too. Literary elements at work in the story: As with most parables, Who Is My Neighbor? is plot-driven. The narrative paints the settings minimally, though illustrator Turu provides clever and amusing details that deepen our understanding of both towns. Characters are in place to do their jobs, so the reader does not learn many details about any of them. Their actions reveal the meaning of the parable. How does the perspective on gender/race/culture/economics/ability make a difference to the story? This story focuses on how our cultural understanding of difference drives a wedge between us and those who do not look like we do, eat the things we eat, and sing different songs than we do. The characters in each community are geometric shapes with legs and arms. Both the Blues and the Yellows have fuzzy circles, pudgy squares, and robust polygons in their villages. Each even has members who are physically challenged – blue ovals in wheelchairs and yellow rectangles with crutches. These differences in shapes and abilities do not seem to faze either community. Only color separates and takes on connotations of good and bad. It is worth noting that the main characters in this story are likely children (since each is on a bicycle, and later Lemon is pictured on a scooter) and that the “Samaritan” is a girl. Theological conversation partners: The obvious scriptural conversation partner for this story is the Parable of the Good Samaritan. In the early pages the authors lay out the cultural setting: Blues and Yellows are mortal enemies, and everyone in each community accepts the definition of “neighbor” as someone who shares your color. Children who have no notion of the historical enmity between Jews and Samaritans may gain an important insight into the original parable when they hear this story. The authors stress both in the narrative and in “A Note for Parents and Educators” at the end of the book that fear is the motivating factor not to do good in the two parallel stories. Navy and Powder pass the injured Midnight by because they are afraid that someone might be lurking around waiting to hurt them, too. Despite commentaries to the contrary, Levine and Sasso claim that fear was likely what kept the priest and the Levite from helping the traveler in the original parable as well. Even the young Lemon’s first thought on seeing Midnight injured on the side of the road is that he might be waiting to hurt her. Unlike her two predecessors, though, Lemon allows compassion to overcome fear, and she goes on to get Midnight to the help that he needs. The original parable does not tell us whether the encounter between the Jew and the Samaritan had any effect on the relations between the two cultures more broadly. However, the chance encounter between Midnight and Lemon In Who Is My Neighbor? helps the Blues and the Yellows to reframe their attitudes toward one another in a larger sense. In the final celebratory scene, illustrator Turu pictures a happy picnic by the seaside. In a (quite probably unintentional) homage to Peter’s dream in Acts 10: 9-23, Blues are eating bananas and drinking lemondade, while Yellows are eating blueberries and drinking grape juice, heretofore non-Kosher foods for each. By expanding their definition of neighbors, both Blues and Yellows are living the truth that God can make all things new. Which town would you rather live in – Blue or Yellow? Why? Why do you think that the Blues don’t like the Yellows? Why don’t the Yellows like the blues? What would you do if you saw someone like Midnight on the side of the road? Would you be afraid to help? Why or why not? This story is a lot like the Parable of the Good Samaritan in the Bible. What parts are similar? What parts are different? How did the Blues and the Yellows get to be friends at the end of the story? What would God want us to do if we found someone who was hurt? Thanks to Beth Lyon-Suhring, Union Presbyterian Seminary alumna and Director of Chrisian Education at St. Andrew Presbyterian Church, Suffolk, VA, for writing this week’s book review. Who Is My Neighbor? by Storypath is licensed under a Creative Commons Attribution-NonCommercial 4.0 International License.